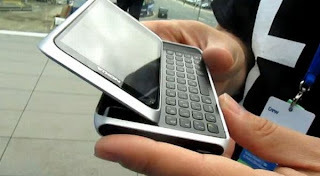 Transformation Communicator Nokia E7. ~ " World Information "
Still remember the triumph of the communicator is made by Nokia? Although these long lasting sweet memory as a business phone, but the prestige of the mobile phone is a bit dim lately. Until finally Nokia to revive 'memories' that by presenting a series of E7. Priced at Rp 6 million, it's obvious Nokia do not want to sink half-hearted hand-held devices based on Symbian ^ 3 this. There are a number of advantages to support the E7 as a true business phone. Similar design N8In terms of appearance, at first glance because the user will kecele glance looks very similar sort N8 series. With a cast aluminum at the corners of the unusual, and was impressed futurustik, making this phone is sturdy and comfortable in the hand. What makes it different, of course, in E7 was added keyboard qwerty keyboard to support features that require a physical keyboard. The more complete it with capacitive touch-screen presence. To Accelerometernya also run fine on the screen is 4 inches. With a battery that has a built-in and can not be removed, making space on this device is very broad. Keys 'home' which is located at the bottom of the screen, making only one button and multifunctional for this phone. It seems that Nokia want to spoil fans with a wide touch screen and can not be contested. The right side and left-E7, there are USB ports and HDMI port, which pulled in addition to support to connect with a large screen, USB port is also capable of opening files flash disk, with the enhancements of course. By 8-megapixel camera diusungnya came with many features, such as brightness, digital zoom, ISO settings, white balance, timer, geo tagging and quality. Comprehension when taking a picture is also fairly fast, both outdoors and inside. Because it is already equipped with auto flash. Recommended for businessesDo not call if not identical with the communicator supporting mobile businessman. In addition to open files directly from a flash drive, there are several other features that are suitable for work in mobile. Call it the Mail for Exchange, a premium dynamic Quickoffice, Adobe PDF reader, and F-Secure Anti-theft for Mobile. With prices so wah, rasany indeed fit to be the usual choice for mobile workers and need a capable smart device. The following specifications Nokia E7:Dimensions: 123.7 x 62.4 x 13.6 mmScreen: 4 inches ClearBlack, nHD 16:9 resolution (640 x 360 pixels) AMOLEDOperating system: Symbian ^ 3Networks: GPRS / EDGE class B, Cat9 HSDPA, maximum speed up to 10.2 Mbps, 2.0 Mbps HSUPA Cat5, WLAN IEEE 802.11 b / g / nConnections: Bluetooth, micro USB data cableCamera: 8 Megapixel.